Chickpeas are loaded with nutrients and high in protein and fiber. They have been known to improve weight loss because their high fiber content makes you feel full after eating them. Score. We usually associate chickpeas with Mediterranean foods like hummus. However, India is the leading producer of chickpeas. Chickpeas are ground into flour to be used in many Indian dishes. This is not like hummus sauce over pasta, so don't worry. That would be a strange texture. Instead, I pureed chickpeas and vegetable broth in a food processor until creamy. 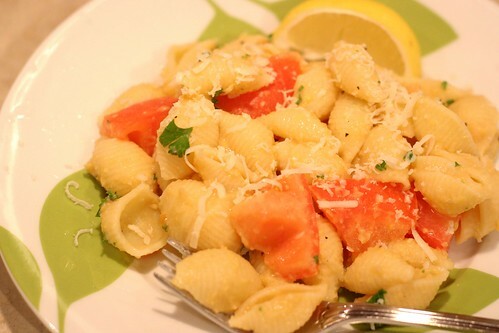 That gets poured over pasta and tossed with fresh tomatoes, parsley, garlic and Parmesan cheese. It is so easy to make this, and healthy too! No butter or cream - just vegetables. I squeezed a little bit of lemon juice over the pasta right before serving it. Such a fresh, clean flavor. Start by making pasta, of course. While the pasta is boiling away, heat up a pot and throw in some olive oil and garlic. Make sure you rinse and drain the can of chickpeas. The syrup/juice/oil inside canned beans makes me want to die. So gross. Pour a can of vegetable broth into the pot with the chickpeas. Let the liquid come to a boil, and simmer it for 10 minutes. This allows some of the liquid to evaporate and reduce. This mixture gets poured into a food processor or blender and pureed until smooth. If you are using a blender, be careful. The hot liquid causes crazy things to happen inside the blender and if you're not careful, the lid will fly off and chickpeas will be all over your kitchen cabinets. This may or may not have happened to me once when I was making butternut squash soup in college. Butternut squash puree may or may not have gotten all over our white cabinets and floor... (right, Lauren?) I always lay a kitchen towel over the lid and press down firmly while blending any hot liquids. Pour the chickpea sauce over your pasta and mix it together. 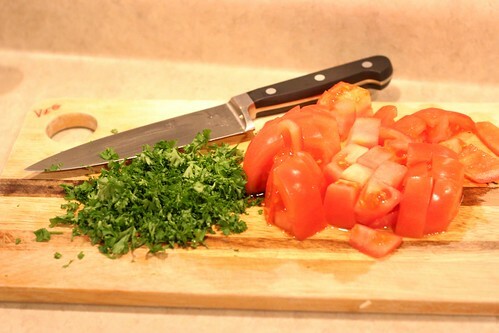 Then chop up a large tomato and some fresh parsley. Toss everything together and taste it for seasonings. I added a little extra salt and pepper at this point. 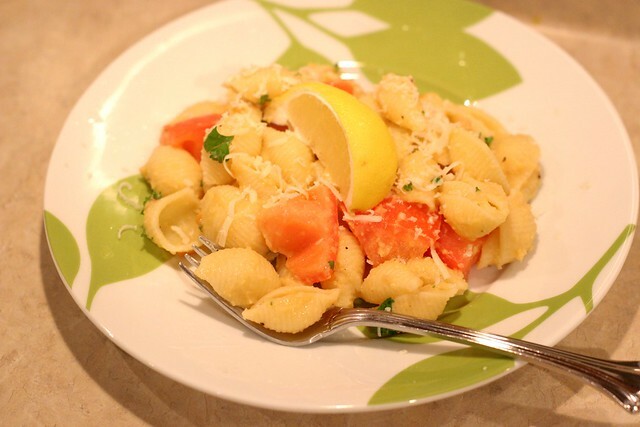 Over each individually serving, grate fresh Parmesan cheese and squeeze a little lemon juice over the pasta. I have found that putting cheese on the plate of pasta instead of the whole pot uses less cheese overall, which cuts down the calories. Parmesan is such a strong flavor, you don't need to use that much to get that nutty, cheesy flavor. This is definitely something different, so I hope you try it! Cook pasta in boiling water for 9 minutes, or until al dente. While pasta is cooking, heat oil in a medium saucepan over medium heat. Add garlic, saute 1 minute. 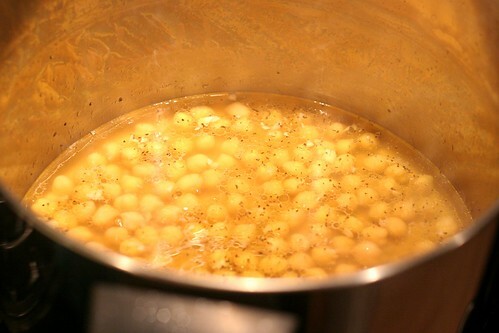 Drain and rinse chickpeas in a colander, then add to pan. Add can of vegetable broth and stir. Let this mixture come to a boil and reduce heat to low. Simmer for 10 - 12 minutes. Place chickpea mixture in a food processor or blender. Process until smooth. Pour sauce over pasta in a large bowl or pot. Toss with tomatoes and parsley. Season with salt and pepper. 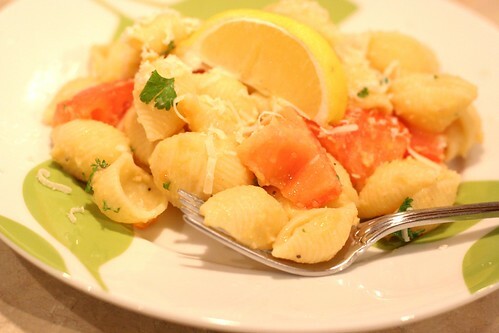 Over each individual serving, grate Parmesan cheese and squeeze with lemon wedge. Serve immediately. The tomato and lemon really brought it home for me. Throw the parsely in there and... shew. wow i never thought about pureeing chickpeas and broth to make sauce! great idea! i'm all about healthy yummmy food hehehe. I LOVE the simplicity and the fact that I tend to have these ingredients on hand. We do a pasta pretty regularly with whole chickpeas, spinach, tons of garlic, raisins and parm so I'm sure we would love this! Thanks for the great idea! Whoa! This is almost like a chickpea alfredo sauce. I love a creamy sauce that I can feel good about eating! 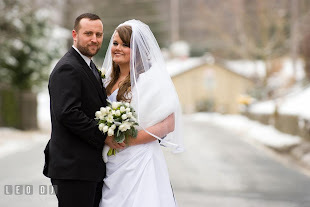 Thanks Jenna!